However, since the 1980s, the long-term trend has been toward a slowdown in the annual growth rate of research and development expenditures according to data presented in the new, 2019 edition of IC Insights’ ‘McClean Report—A Complete Analysis and Forecast of the Integrated Circuit Industry’ (released in January 2019). 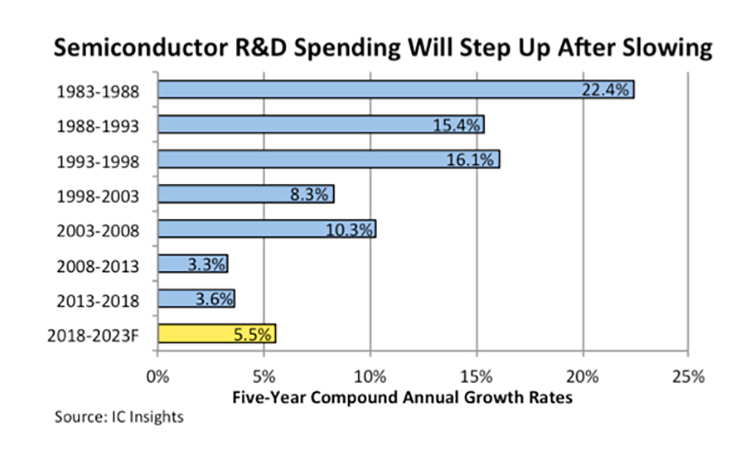 Consolidation in the semiconductor industry has been a big factor contributing to lower growth rates for R&D expenditures so far this decade. In the most recent five-year span from 2013 to 2018, semiconductor R&D spending grew by CAGR of 3.6% per year, essentially unchanged from the 3.3% experienced from 2008-2013. R&D spending trends discussed here cover expenditures by integrated device manufacturers (IDMs), fabless chip suppliers, and pure-play wafer foundries and do not include other companies and organizations involved in semiconductor-related technologies, such as production equipment and materials suppliers, packaging and test service providers, universities, government-funded labs, and industry cooperatives, such as IMEC in Belgium, the CAE-Leti Institute in France, the Industrial Technology Research Institute (ITRI) in Taiwan, and the US-based Sematech consortium, which was merged into the State University of New York (SUNY) Polytechnic Institute in 2015. With the value of more than 90 merger and acquisition agreements topping $250bn since 2015, tremendous consolidation has been underway among semiconductor suppliers, many of them major IC companies, which have been cutting costs by hundreds of millions of dollars and leveraging ‘synergies’, meaning the elimination of overlapping expenditures (such as, jobs, facilities, and R&D activities) in an attempt to achieve higher levels of productivity and greater profits. After rising just one percent in 2015 and 2016, total semiconductor R&D spending grew six percent in 2017 and increased seven percent in 2018 to reach a new record- high level of $64.6bn. During the last 40 years (1978 to 2018), R&D expenditures have increased at a compound annual growth rate of 14.5%, slightly higher than the total semiconductor revenue CAGR of 12.0%. Since the year 2000, semiconductor R&D spending as a percent of worldwide sales has exceeded the 40 year historical average of 14.5% in all but four years (2000, 2010, 2017, and 2018). In these four years, lower R&D-to-sales ratios had more to do with the strength of revenue growth than weakness in research and development spending.